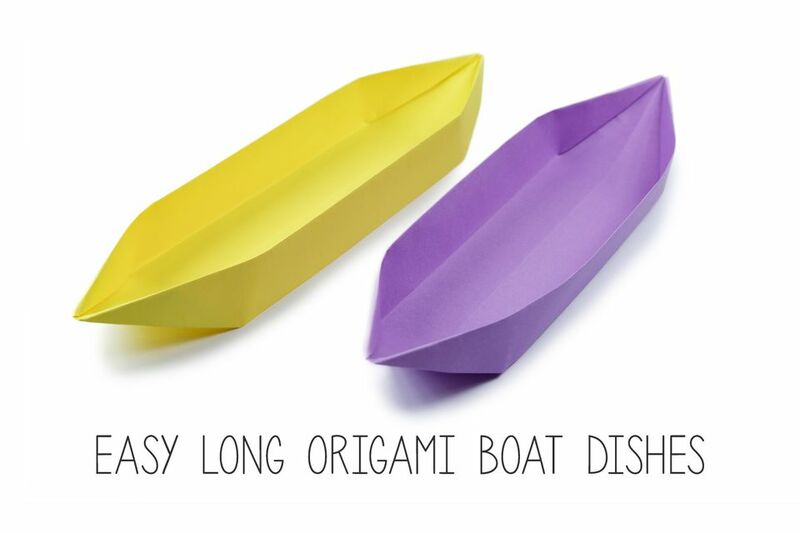 Learn how to make a long boat shaped origami serving dish, from a rectangular sheet of paper. Great for serving snacks or as a desk tidy for pencils. This is a variation of the traditional origami box, and is very easy to make. You'll need 1 sheet of rectangular paper, use A4 or letter paper. If you'd like a really thin boat or dish, use a thinner/longer rectangle. There is also a more complicated origami boat dish, that has a inside-out action at the end, here. Looking for another boat themed origami, check out this cute stand up sailboat. 1. Start white side up, with the paper in a landscape position. 2. Fold the bottom up to the top. 4. Fold the top and bottom edges to the central crease. 5. Flip the paper over to the other side, left to right. 6. Fold the bottom edge to the central crease, letting the paper flip out from underneath. 7. Here you can see the arrangement of the folds from the side. 8. Do the same process on the top flap. 9. Flip the model to the other side left to right. Fold the lower section of the flap in the middle, up. 10. Fold the bottom edge to meet the crease above. 11. Here it is creased. 12. Fold the bottom left corner inwards. 13. Fold the top right corner of the front section diagonally down to align with the previous fold. 14. Fold the bottom right edge up again. 15. Fold the flap above to match the last crease. 16. Repeat on the left side of the paper. Fold the top section of the front layer down. 17. Fold the front layer down. 18. Fold the top edge to meet the crease underneath. 19. Here it is creased. Repeat the previous process on the corners. 20. Fold the lower section of the front layer back up. 21. Flip the model over to the other side. 22. Open the box out. 23. Be careful not to rip the paper where the points of the 'boat' are. Now it's finished. you can give it a more square look by folding the points inwards completely so that you can crease the bottom.